This year the Cloughjordan Heritage Group especially honours the memory of Muriel Gifford MacDonagh who tragically died on 9th July 1917. 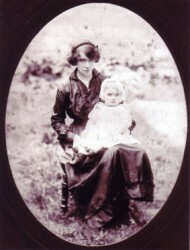 Muriel had been an activist in her own right, distributing food in the 1913 Lockout and a member of Inghinidhe na hÉireann. Three of her sisters were involved in the Easter Rising: Nellie was in the Irish Citizen’s Army under the command of Michael Mallin and Countess Markievicz in Stephen’s Green; Grace married Joseph Plunkett on the eve of his execution in Kilmainham Jail; and Sydney, a journalist, found her voice in the journals of the time writing under the pen-name of John Brennan. The Thomas MacDonagh Summer School will take place on Saturday, 29 April, from 10am-4pm. Through her research Mary became interested in the contributions of women to Irish history, from the medieval to the modern and has gone on to publish several books. Lucille Redmond, great-grand-daughter of Frederick and Isabella, shares her family history with us. She is a regular and welcome contributor to the Summer School. Mairín was one of a group invited to creatively respond to the stories of the seventy seven women imprisoned in Richmond Barracks after the Rising. This project reflected the diversity of women’s experience in contemporary Ireland. Caimin O’Brien will share his expertise in a talk on the ring fort and site of the Aonach or ancient gathering at Rathurles. Following his talk he will lead a guided tour of the site, with the kind permission of the Brereton family. Open: Tuesday - Sunday 12-4 pm with late opening on Friday 4-7pm.